We believe that your wedding day should be a fusion of the best things about you and your partner's life together. Allow us to help you throw a memorable and amazing sounding wedding. Our goal is to have a packed dance floor all night long. Our DJs have expertise in almost every genre. We thrive when collaborating closely with our wedding couples to deliver exactly what they want to hear. We feel equally at home at big classy events with crowds of 400 and at intimate, relaxed boutique weddings. Planning Assistance: The very first step is to help you develop a detailed timeline for the entire party that we can work on together and refine as your event gets closer. Music Selection: We ask our couples to start by giving us artists and songs that they enjoy. Our DJs can use that list to build out a playlist that is full of great songs that you love as well as tracks that we know will get your guests out on the dance floor. Share music selections with us by any method that makes you comfortable: Google doc, text messages, Spotify playlists, or just in conversation when we chat. Great Communication: We are very easy to contact and are happy to have as many conversations or meetings as you would like as we both get prepared for the big day. We are often in touch with your photographer, caterers, and other vendors to make sure everything happens flawlessly. Professional Quality Sound: As musicians and audio professionals we care about great sound quality. We provide professional speaker systems, high-quality music files, and professional emceeing that is never annoying or awkward. Reliability: We'll be at your event early and will work as hard as we can to make sure everything is executed perfectly. 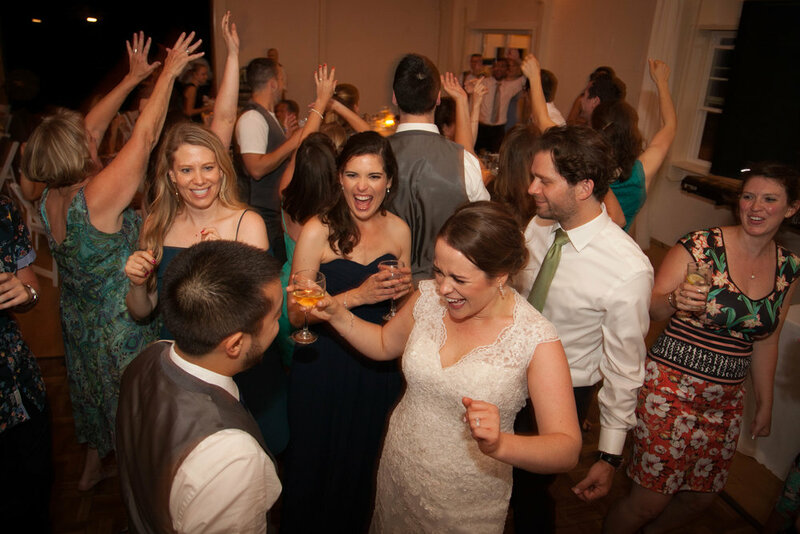 Our favorite weddings to DJ are those where the couples work as a team with their DJ to make the big day happen. Ridiculous Entertainment's DJs will be proactive and attentive to your desires throughout the whole process. Full Service Reception Package ($1150): Four hours of full service for your reception under 150 guests in one primary location. Includes all meetings, a custom playlist, help with scheduling, emcee services and the best DJing money can buy. We do not charge for setup or breakdown time. Here are some frequently asked questions for those who may not have planned a wedding before. Absolutely. We are music lovers and your DJ has a gigantic library of high-quality digital files covering almost any genre. We prefer for our couples to start our music conversations by writing a list of of artists and songs they love and describing their tastes. There's no such thing as too much information. Some couples are very hands on with music selections and give us tons of must-play requests, while others just give us a couple of songs and leave the rest to their experienced DJ. There is no right or wrong way, and we are happy to work in any way that makes you comfortable. Can I give you a "Do Not Play" list? Will you help with emceeing or doing introductions? Yes! We're usually on the mic to announce events, smooth over transitions and make sure all the guests understand what is happening at any given time. You can expect your DJ to be completely ego-free in their announcements, avoiding corny jokes and keeping the focus on a great party with great music. If you want to do a big crazy introduction we are happy to oblige. Can you help keep the event running on time? Yes. It's normal for your DJ to collaborate with all the people needed to keep your wedding on schedule. The very first thing we do with all our couples is create a detailed timeline for us to work from. Ridiculous Entertainment often coordinates with the catering team, venue managers, photographers and videographers to make sure everything happens smoothly and without stress. At some events a wedding planner might take the lead—this also works well for us! Do you charge for set-up time? Is there a limit on meeting time? Nope. Every wedding is different, and we promise to work with you until we have all the details planned out. We can meet in person, over the phone, through video calls, or just by exchanging emails. Can you play this really obscure song I want to hear? Can you edit music or make custom mixes? You bet. Let's talk about what you want and we will tell you how we can make it happen. Do you use vinyl records? Not anymore! Aran started his DJ career using all vinyl, but these days all our DJs use a digital controller that emulates the old-school two-turntable setup. When DJing dance music we can be very hands on, mixing actively to keep the energy high, even with a digital setup. Do you scratch a bunch when you're mixing? Not usually at weddings. 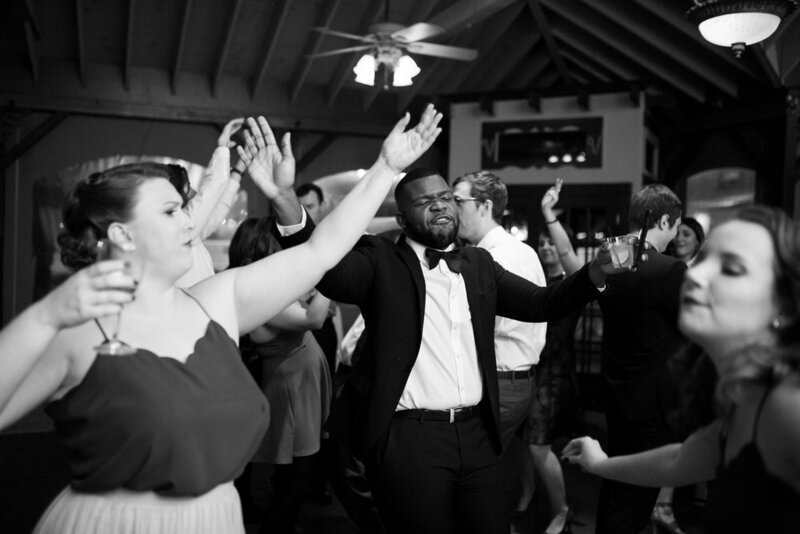 We try to stay really closely tuned into the dance floor and really only scratch or do hip-hop style mixing at weddings when clients request it specifically.